Oh you guys, I’ve been been hinting about our new dining room table over on Instagram for months…..and have been dying to share it! Last fall, we were talking about buying a new kitchen table but we needed something round to fit our dining room space but everything was SO expensive. Boo. We never even considered making a table……but realized we’d save HUNDREDS of $$$ if we just made what we wanted! Instead of round, we went with an octagon shape that actually fits 8 people comfortably…..and we LOVE it! Anyway, I took lots and lots of pictures to share with you guys how we put our table together…..and today was the day to finally share!!! I have had one sick little baby who has needed a lot of momma holding the past 2 days. Yeah, that sweet little Oliver of ours has had the flu and wasn’t able to keep anything down, ugggh…..so I’ve actually been enjoying a lot of snuggling with a feverish and flu-ish little person (with a big red bowl nearby at all times). So, the tutorial will have to wait, but I can hardly wait to show you that you can absolutely make your own octagon shaped dining room table!!! Here’s the assembled table top, before we stained it……and another photo of my husband Steve attaching the finished table top to the base we created! Both were snagged from my Instagram account from last fall. Anyway, while doing a lot of sitting the past few days (with a sad little Oliver draped across my lap), I was looking around online for some new ideas to keep this little guy out of things. Because Oliver is INTO EVERYTHING! Day in and day out, he explores our home like his own little playground and empties cupboards, digs through drawers, pulls food off of pantry shelves, empties tissue boxes, drags baskets out of place, chews on everything, steals shoes, pulls on cords, dumps out boxes of anything, and on and on. Yep, it’s totally normal and healthy for a growing little 19 month old……so I’ve needed a few more ways to slow this kiddo down! And while looking, I found some other ideas that I don’t necessarily need, but thought were super clever ideas to childproof the home, that some of you may find useful! I love SafePlate outlet covers. They look better than regular outlets and aren’t choking hazards when little fingers get more skilled. We liked them so much that we left ours up when our son outgrew that stage. Those are really good ideas! 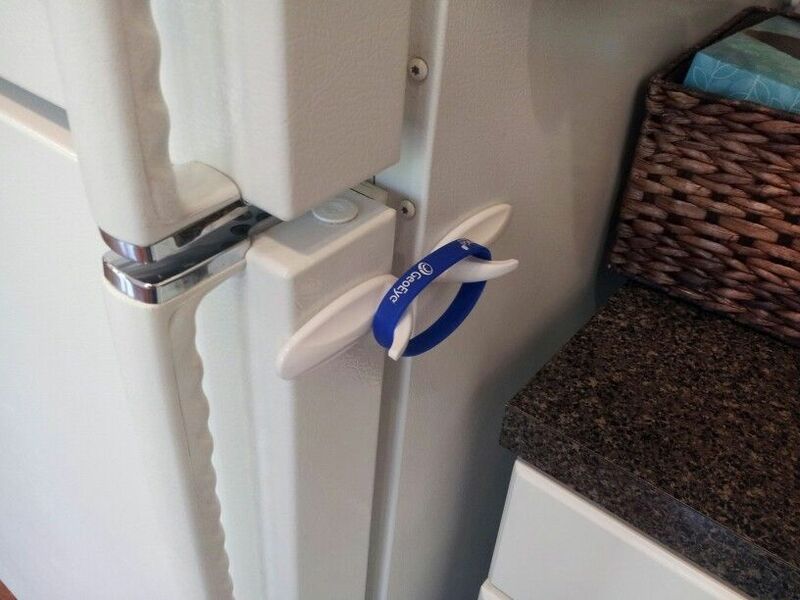 My favorite is the fridge lock with the bracelet and the toilet paper/rubber band one. Too bad my three year old can figure out some of them. I wish there was a good way to keep him out of my craft room! I hate to keep the door shut because it makes the small room either hot or cold depending on the seasons. I have a gate to keep lil’ sis out, and to remind him not to climb over, but he does all the time. He’s into my buttons right now, and it’s a choking hazard with 15 mon sis around. I’ve been thinking of a half door, but we’ll see! :) If anyone has some good ideas, let me know! Thanks for the post! Oh and I hope that Oliver gets feeling better really soon! Sick kiddos are the worst! Thanks Ramie, I mentioned this to my husband over the phone yesterday, and he came home from work and turned my door into a dutch one this afternoon! I love it. :) thanks for your idea. Try a screen door or maybe cut a screen door in half. That way you can do your crafts and stay cool/warm while still being able to see the babies. I had this issue too with my dogs first, then my children. I installed a hook and eye assembly, only a couple of $ at the local hardware. It allowed me to keep the door safely ajar only about 2 inches. Good luck. My daughter cut the door in half like a barn door. Worked great. You can get a cheep door to do this and then when not needed put your original door back up. I could so totally make that cabinet door lock w/ the string. I have saved a couple of those spring clasps from the drawstrings on jackets (you can buy them, too, but at that point the cost is pretty much the same), and all I’d need is a shoestring. some great ideas here. some of them are genius! love the mesh over the vent idea. Another permanent option, if you are handy with a circular saw would be to modify the door by cutting it in half creating a Dutch door. You would have to install another upper door hinge and cut about an inch off the top half to trim it. This is an excellent fix to a stair way door/ landing. We did it when they were babies and have kept it that way for 15yrs. Keeps the kids safe and the dogs out of the trash and recycling. Here is an excellent Blog You may Locate Interesting that we encourage you to visit. I had this issue too with my dogs first, then my children. 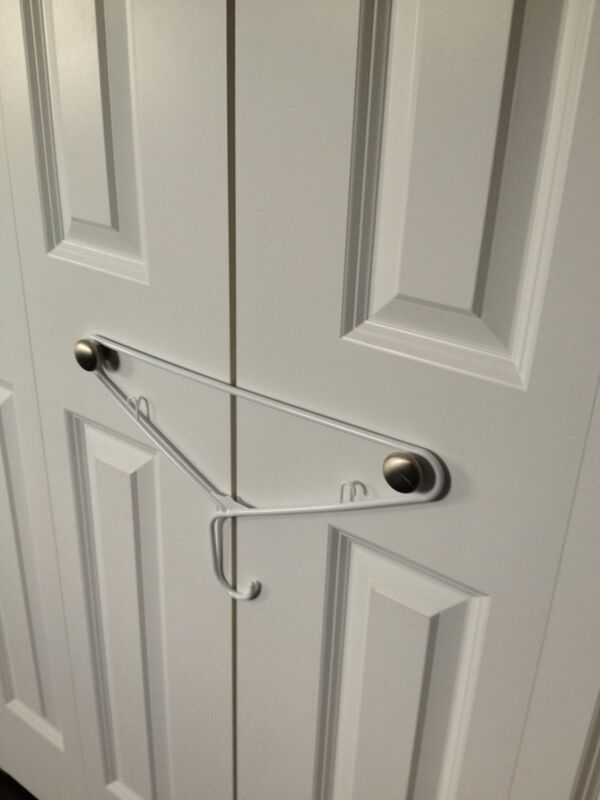 I installed a hook and eye assembly, only a couple of $ at the local hardware. It allowed me to keep the door safely ajar only about 2 inches. Good luck.!!!!!!!!!! !